Pet Works Owner Lynn Reece Broderick started her professional pet training business in May 2005. She is a member of the Pet Professional Guild, and is an AKC Canine Good Citizen evaluator. 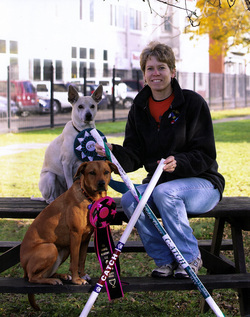 Lynn has extensive experience in dog behavior & training, safe animal handling, canine temperament evaluations, teaching dog obedience, canine behavior counseling, and training & competing in dog agility. Lynn began her career in animal behavior in 1999 at the Erie County SPCA here in Buffalo NY, developing and directing the innovative Animal Behavior & Training Department. Her duties included canine and feline behavior advice, training & stress reduction programs for the shelter animals, Family Companion and Puppergarden dog obedience programs, canine temperament evaluations, pet adoption counseling, and the TLC Program, which taught inner-city teens to train shelter dogs using positive reinforcement (praise and reward) techniques. She welcomed many foster dogs into her North Buffalo home during that time. Her philosophy on training pets is to understand why they do what they do, and to use scientifically proven positive reinforcement techniques and good management to elicit any behavior modifications that are necessary. She tries to impart that knowledge to the owners, so they can understand their dogs and have the skills to continue teaching, training, and living happily with them. Lynn enjoys working with and teaching the owners as much as she enjoys the company and training of the animals! She believes that training and living with pets should be fun and rewarding, and when she creates a training program, she always tries to make sure everyone, human and canine, is enjoying the experience. 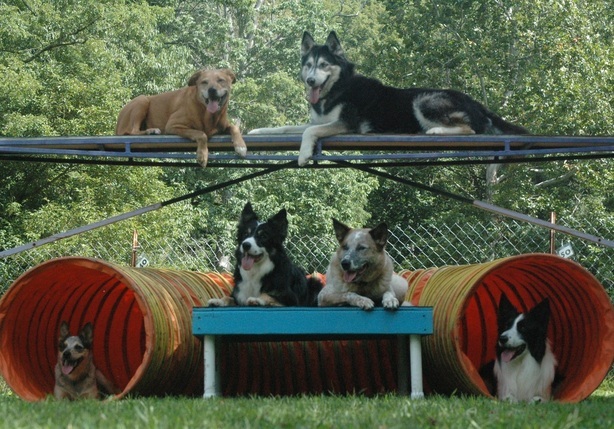 Lynn discovered dog agility in 2000 and has put countless titles on her dogs and friend's dogs. She started teaching agility in 2005, and loves sharing new techniques and handling strategies with her students. She also dabbles in Herding, Rally Obedience and Dock Dogs, and has earned AKC Canine Good Citizenship certificates on her dogs Riley and Amber. Amber has competed in four CPE National and two NADAC Championship competitions, as well as the 2011 Purina Incredible Dog Challenge Large Dog Agility event. Her recent challenges have been training a very fast border collie in agility, and learning to herd sheep with another border collie boy. Lynn is proud to be affiliated with The K-9 Kids Club, a dog daycare located on Niagara Falls Boulevard in Tonawanda. She is actively involved in the Four Seasons Agility Club, Up and Over Dog Sports, and assists Black Dog Second Chance animal rescue. The Pet Works Training Team members come from all walks of life, but all share a common love of dogs and helping owners learn to live in harmony with them! Each trainer strives to make learning fun for both families and their dogs, and work hard to ensure that each student receives plenty of personal attention during our training classes.